Staying healthy with fun interactive games! My friend from my university days, Kaoru-chan. She introduced how she uses an interactive game with her daughter to exercise. On weekdays, I work, so I get home around 6 pm at the earliest. After that, I eat dinner with my family, take a bath, then go to sleep. I don't have any time to exercise to maintain my body figure or health. A few months ago, I received an interactive game machine from my friend. 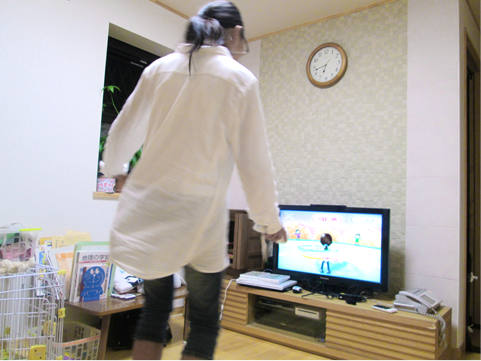 On weekends, I sometimes do yoga and balance games with some fitness software with my junior high school aged daughter. 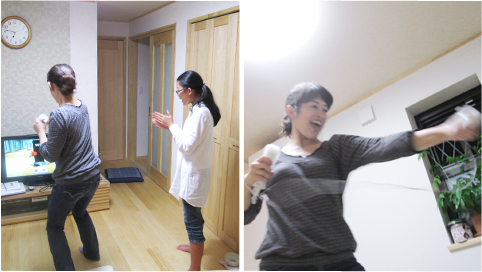 Doing exercises with an interactive game machine is very fun! I really like it because I don't have to worry about the weather or the time and I can do it in my room. It becomes a good way to communicate between parent and child. I want to continue trying it with my daughter. Now, is this happening in Japan? I know people who have lost weight this way. I don't really play games, so I was surprised by this! I'm playing an interactive game machine with my daughter. This is a boxing exercise. It clears my mind and my body! Who is the person you're punching? You're really into it! Haha! In the balance game, your balance age is displayed. On this day, this was the first time I reached an age 10 years lower than my actual age! I'm happy! Yes, it's a happy thing! My daughter tries the balance game as well! Her reaction time is faster than mine, so she's good. Great! On this day, after we finished, we have a toast with tea! On weekdays, I'm busy, so this is a very important communication time. Parent and child can sweat and communicate! Two birds with one stone! Japanese things or foreign things?